Officially licensed GM Restoration Parts Reproduction of the rare optional 1967-68 Bow Tie locking gas cap finished with a high quality chrome edge. 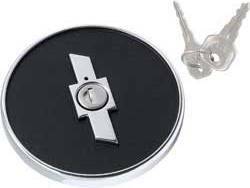 The center features the Chevrolet Emblem in polished chrome, also includes two pre-coded keys. Use the drop down menu below to select your shipping location.